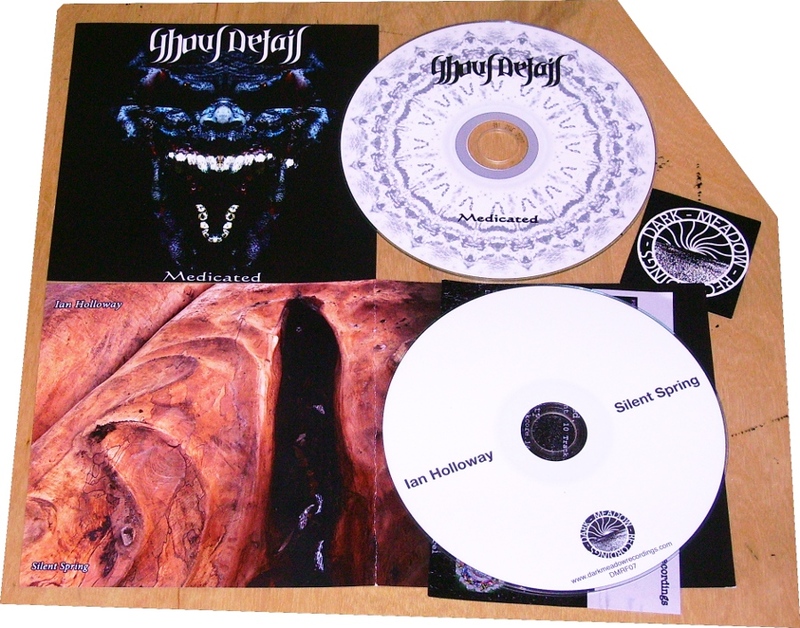 Took in five CDRs from the netlabel Dark Meadow Recordings which is a home to various marginal musics of a supernal nature…Ian Holloway‘s Silent Spring (DMRF07) is a single 45-minute piece of sinister drone-working intended to keep listener in a perpetual state of tension and achieves its disquieting effects with great economy. In an ideal world Holloway would be offered soundtrack work, especially considering the proliferation of quasi-supernatural TV shows that abound on our screens. Ghoul Detail offers Medicated (DMR006), 10 tracks of oppressive and unsettling psychic spew that burrows its way into your brain-pan like a vapourous worm. Like Alan Moore, that self-proclaimed magickian, Ghoul Detail (also called The Soundscape Gardener) lives in Northampton, which does make me wonder if that part of England is indeed a central site for the paranormal, as many seem to claim. As you may guess, many of Ghoul Detail’s track titles refer to some form of pharmaceuticals, and hearing this music is probably about as far as you can legally warp your mind without forging a prescription. Still on this label that proposes to spread ‘harsh ambient, noise, industrial’ music across the face of England, Pink Venom slither forth from their caverns to describe Waste Of The World (DMR005). Quite long tracks upfront which bodes well, and anything which whispers of the ‘End Of Days’ has some promise, but ultimately Pink Venom’s distorted overdub slow-dronery lacks real bite, and comes across like a pallid cousin of Nadja. Earth Incubator is Alexander Kibanov, who in just a few years has managed to rack up a substantial number of releases in his “post-industrial” genre. You Have Entered The World Of Survival Horror (DMRF03) mingles apocalyptic science-fiction themes with equally troublesome ecological disaster themes, and sternly and quietly demolishes entire continents using the power of minimal electronic drone. Like many of the releases on this label the pervasive force of this music is so subtle you’re not even aware of the damage it may be causing your body as you fall under its narcoleptic spell. Lastly we have Gravity (DMR007) by Hoist, which appears to be a compilation of three EPs, and of the bunch here I genuinely don’t know what to make of it; it’s an odd mix of beats, piano patches, voice samples and wonky electronic stabs, produced in a jumbled-up fashion that makes no sense to these ears at all. No rhythms, no patterns, just disjunctive and absurd phrases cast out at random. Now here’s a new release from the High Vizier of Monotonous Noise himself, Vomir, whose Application à Aphistemi (MAISON BRUIT) arrived in the middle of March. The first track ‘Paulina Semilionova irait à l’équarrissage’ (a title worthy of Max Ernst, that) is Vomir’s familiar cannon-blasting assault of unvarying harsh noise wall, created with his ‘noise generators’ and effects, and it’s 38 minutes of brutal ear-bombing that insists on occupying your personal space as surely as if your home were invaded by Mr Five-By-Five, a fictional character I just dreamed up who is made completely of concrete and whose sole malign function is to march into your living room and expand his square-shaped body until you’re either crushed to death, or relocated elsewhere. Well aware of the harmful, flattening effects of his noise, Vomir includes a text insert that lists all manner of unpleasant sensations, including psychological and physical, many of them suggesting that simply hearing this music will not only make you unwell, but actually pass on an incurable disease. Horrible! – but for Vomir this is business as usual. The second cut however astounded me. ‘L’Apparence Du Vrai est un moment du faux’ was recorded using a 12-string semi-acoustic guitar, and it’s much more interesting, and is in fact a complete departure from the triple-strength old-school brand of table noise that Vomir has been pursuing for many years now. No less grim or relentless than his usual mode, this 18-minute acoustical monstrosity of flat and dreary noise music emphasises the steel-ness of the guitar’s strings, and comes across like a malfunctioning telex machine, or a gigantic typewriter from a surreal civil servant’s nightmare. If you’ve ever read the short story by Kafka ‘In The Penal Colony’, then this is undoubtedly the sound produced by that grim machine of torture. Great work, Romain! Ed, thank you so much for your continuing support and attachment to my work. We just did a HNW fest in Paris with people coming from all over Europe, and it turned great. More releases to come soon, regards, R.